Her name is Sinauda Aura (read Orah) I had been contemplating for days on how to get a hold of her. I had held on to the idea, I needed to get a lady playing the sport on the blog, to speak out on her experiences, skills, thoughts on a number of things. I wanted the aura of Aura here. T.B: You have grown to be a prominent player at the Kenya Lionesses, when did you start playing rugby and where? S.A: I started playing in 2015 my first game was at Nakuru 10’s. Why did you choose rugby as opposed to other sports? Actually, what most people don’t know is that I’ve always participated in sports. From swimming to handball you name it. I was actually playing in the Basketball National Premier League before I switched to rugby. It’s (rugby) a high contact sport, you are well athletic and conditioned now, but back in the days when you started playing you were not. Were you sceptical of the contact related to the sport? I’ve always loved working out so for me rugby served as a platform to learn and demystify certain myths involved with rugby, women and the gym. Naturally, I feed off adrenaline so it was a perfect spot for me. What/Who was your source of motivation to get along with the sport (of rugby)? The basketball team I played for used to train at Railways Club and I remember seeing ladies (who I later came to learn were Mwamba Ladies) training. I was attracted to the intensity of the training and that’s just how I moved. Many would say they know you play internationally for the Lionesses but wouldn’t know your local exploits, which team do you play for currently? I started off at Mwamba but moved to Northern Suburbs formally known as KCB. 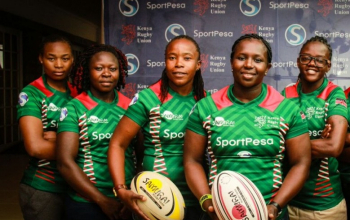 We don’t have as many fixtures of the Women’s League in Kenya, compared to the men’s version. Do you think this is the biggest hindrance to the popularity of the ladies’ game? 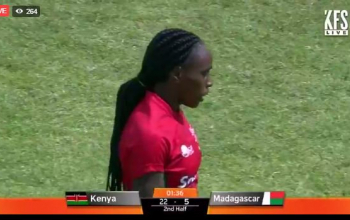 What was your debut experience for the Kenya Lionesses? 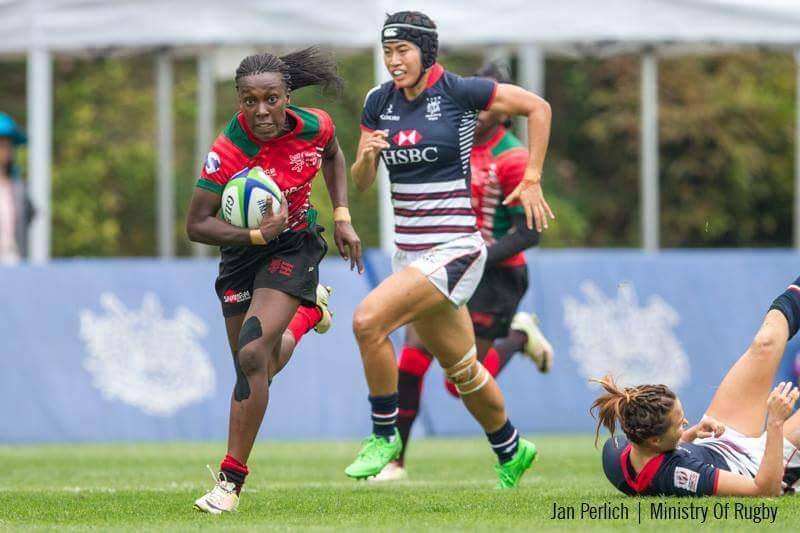 My highlight tourney has got to be when I scored the winning try for Kenya (in Elgon Cup)… my confidence and thirst to grow in the game just shot into overdrive. 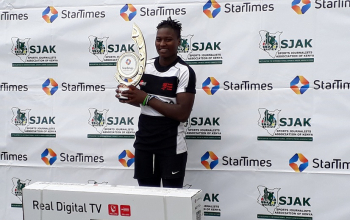 The Lionesses have been to quite a number of tourneys, thanks to an effort by the Kenya Rugby Union and allied stakeholders. I am sure you must have one that you’d consider as the best outing…. 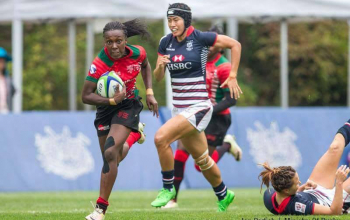 Personally, it had to be WSWQ (Women Sevens Series World Qualifiers) in Hong Kong early this year. Heck! I surprised myself. As a team, I’d say World Cup/Common Wealth qualifiers. We brought the game to South Africa (the country and the team, I bet). About the South; the Lady Blitbokke’s has now been a huddle for Lionesses’ qualification Women’s Rugby World Cup a number of times, the fourth time they said this year. Going forward any suggestions on what the team ought to consider for probably improved results? I’d suggest more exposure for the Lionesses i.e. more international games/ camps because that’s the only advantage they have over us. NOTHING ELSE! Kenya Lionesses didn’t make it to the World Cup but are in the Commonwealth Games. What are your personal targets? First and foremost, I’m aiming to make the squad that represents the country and secondly, considering my position, I will be playing against the likes of Portia Woodman of NZ, Ellia Greene of AUS who are my idols. Boss! I need to make sure they remember me when we meet. I train at least 4 days a week of which 2 days and sometimes Saturday mornings I do sprints and sprint techniques. I balance the other days between the rest of the body and extras in regards to the game; kicks and passes of the 4 days, mornings I train with the rest of the team, afternoons I do my personal training and with the club in the evening. In rugby players are constantly conditioned for the physicality, but many times there are certain errors in this course for fitness, have you noticed any that you could give a tip on? Secondly, Many have the “strong” mentality… heavyweights don’t necessarily equate to results especially if the technique is wrong. QUALITY OVER QUANTITY PEOPLE. Any three gym routines as a rugby player you advise fellow players not to skip? Many are quoted to say rugby is a lifestyle. Has the sport of rugby made you adjust your lifestyle? Yes!! You have got to take care of your body for it to take care of you and do what you need it to. Your mind as well. I’d say not only my physique has changed since I started playing. My mental strength has also shot up to another level. 2017/18 season is about to kick off, predict three teams to finish in the top four in the Kenya Cup by Christmas break. The best gift you could give yourself is acknowledging that your journey is different from other peoples’. Set your goals and targets and work towards them diligently but above all, put God first.